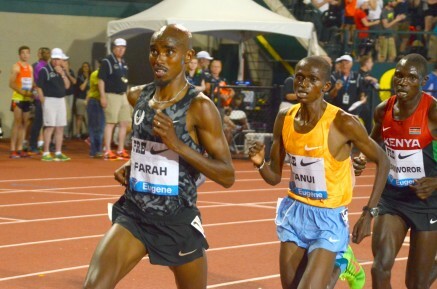 31st May 2015 – Double Olympic & World Champion Mo Farah (GBR) won his second Prefontaine Classic 10,000m title with a strong last lap sprint to stop the clock in 26:50.97. His time puts him on top of the 2015 world list but speaking to reporters after the race the 31 year old expressed frustration over the lack of pacing help in his attempt to run a much faster time. Training partner Matthew Centrowitz (USA) got his highest ever Diamond League placing with a great run to take 2nd in the Bowerman mile in 3:51.20, just 0.1 secs behind race winner Souleiman. Former University of Oregon star Galen Rupp (USA) placed 3rd in a tactical 5000m in 13:12.36, satisfying for his first track race of the 2015 season. Returning to the track for the first time after maternity leave former World Champion Vivian Cheruiyot (KEN) was happy with her 3rd place finish in the women’s 5000m in 14:46.69. Shannon Rowbury (USA) led the women’s 1500m for 3.5 laps before being overhauled in the final straight eventually taking 4th in 4:02.28. Emmanuel Bett (KEN) placed 6th in the 10,000m in 27:22.34 ahead of Timothy Toroitich (UGA) who ran 27:39.71. Vincent Kibet (KEN) improved his mile personal best to 3:55.65.